01 - Kalenda Rock Votre navigateur ne supporte pas la balise audio. 02 - I'll do anything you say Votre navigateur ne supporte pas la balise audio. 03 - Love your spell is everywhere Votre navigateur ne supporte pas la balise audio. 04 - Cecilia My Love Votre navigateur ne supporte pas la balise audio. 05 - Calypso Rock Votre navigateur ne supporte pas la balise audio. 06 - Buzz me, Baby Votre navigateur ne supporte pas la balise audio. 07 - The Nearness of You Votre navigateur ne supporte pas la balise audio. 08 - Ol' Man River Votre navigateur ne supporte pas la balise audio. 09 - Foggy Day Votre navigateur ne supporte pas la balise audio. 10 - Lover Votre navigateur ne supporte pas la balise audio.
" 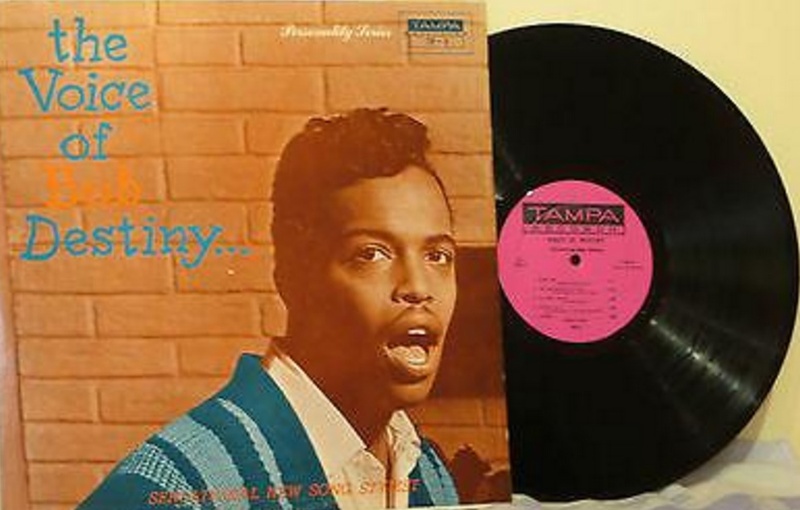 Once in a blue moon a singer comes along with that rare certain something known as talent. It does not happen often. The great popular singer can be counted on ten fingers. They have been some great voices but onlY a chosen few find lasting public favor. Their must be a sense of communion between artist and listener and then too, the song idea must be conveyed with good taste, showmanship and appeal. 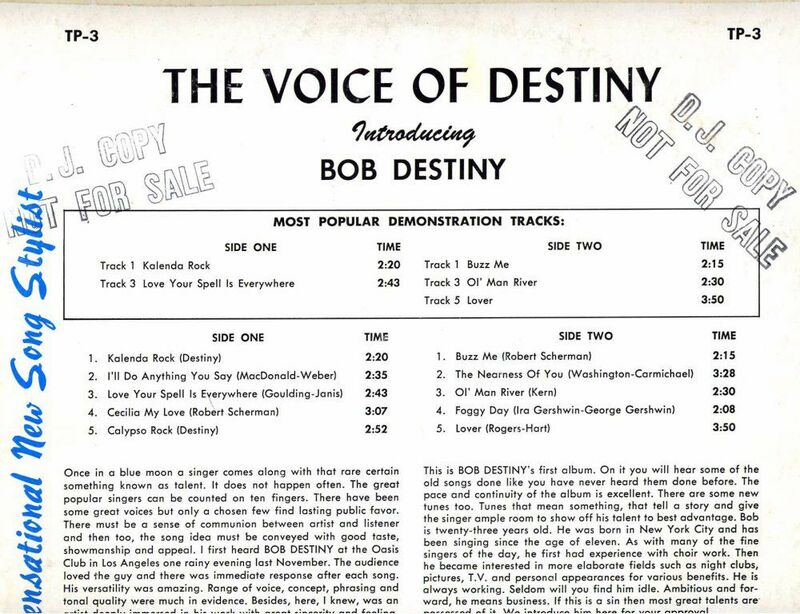 I first heard Bob Destiny at the Oasis Club in Los Angeles on rainy evening last november. The audience loved that guy and there was immediate response after each song. His versatility was amazing. Range of voice, concept, phrasing and tonal quality very much in evidence. Besides, here, I knew, was an artist deeply immensed in his work with great sincerity and feeling.